The presence of yeast neutrophil inclusions was observed and discussed several times in other reports; moreover some works demonstrated how Toxic Granulation Neutrophils (TGNs) are especially helpful in predicting acute bacterial infection, while the development of candidaemia-related TGNs was rarely described and in-depth. We describe two occasional findings of neutrophil inclusions and marked TGNs respectively due to Candida tropicalis and Candida guillermondi on peripheral blood smear. We proved how the microscopic observation of marked toxic granulations can afford to suspect a systemic microbial infection without the potential to discriminate between bacterial or fungal infections. Fungal pathogens, in particular Candida species, have become a major cause of nosocomial infection . Blood cultures are limited for diagnosing invasive candidiasis by poor sensitivity and slow turn-around time  while β-D-glucan detection demonstrates variable sensitivity depending on the cut-off diagnostic value and on the Candida species under consideration. This last presents several false positive results due to albumin and/or immunoglobulin administration, Gram positive bacteraemia or haemodialysis . β-D-glucan, mannan antigen detection and polymerase chain reaction are often expensive and time consuming, furthermore their low specificity could lead to an excessive use of antifungals agents increasing fungal resistance and care costs . A general consensus has not been reached on the usefulness of any of these methods, except for blood culture and histological examination . Yeast with pseudohyphae or those that have been phagocytized by white blood cells are coincidentally found in peripheral blood smears. Nevertheless, the clinical diagnostic value and outcome of candidaemia diagnosed from peripheral blood smears are unclear . We describe two occasional findings of neutrophil inclusions and toxic granulation neutrophils (TGNs) respectively due to Candida tropicalis and Candida guillermondi on peripheral blood smear (Figure 1). Figure 1: Microscopy of peripheral blood smear (May-Grünwald Stain), 100x objective. A 44-year-old man with an history of Focal Segmental Glomerulosclerosis and subjected to hemodialysis for 22 years after a kidney transplant rejection, was hospitalized in the nephrology department due to a lithiasic cholecystitis. A Central Venous Catheter (CVC) was placed and the patient underwent cholecystectomy.Two days after surgery he showed shaking chills and fever of 38.5 °C. Furthermore laboratory investigations highlighted a leukocyte count of 2.8 × 10^9/L (74% neutrophils) and C-reactive protein of 47.4 mg/L (reference < 10.0). 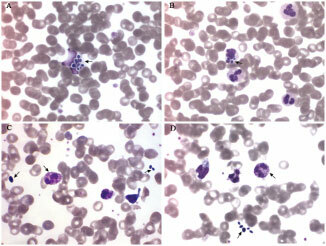 Peripheral blood smear (May-Grünwald Stain) revealed a neutrophil breakup probably induced by phagocytosed yeasts (Panel A) and TGNs (Panel C) induced by candidaemia. Blood cultures confirmed the blood smear findings revealing the presence of Candida tropicalis. CVC was removed and its cultural test resulted positive for the same fungal species. The patient was successfully submitted to antifungal therapy with caspofungin for 14 days. A 50-year-old female patient suffering for HBV-related cirrhosis, was admitted in the medicine unit due to an ascites associated with jaundice and a reduction of the liver function. Two days after hospital admission the patient developed fever (38.2 °C) unresponsive to wide spectrum antibiotic therapy (meropenem) while laboratory data highlighted a leukocyte count of 8.9 × 10^9/L (88% neutrophils), C-reactive protein of 91.9 mg/L ( reference < 10) and Procalcitonin of 0.48 ng/mL (reference < 0.05). On the same day peripheral blood smear (May-Grünwald Stain) revealed some yeast neutrophils inclusions (Panel B) and numerous TGNs induced by candidaemia (Panel D). Candida guillermondi infection was confirmed by blood cultures results, and the speciation of isolates were performed by biochemical tests. The patient was successfully submitted to antifungal therapy with fluconazole for 14 days. Previous reports have suggested that peripheral blood smears may be useful for the detection of disseminated yeast infection  especially in case of central venous lines related candidaemia . The microscopic examination of the blood smear often shows a very low sensitivity, otherwise in case of positivity it allows shorter time to diagnosis compared to blood cultures turn-around time. The presence of yeast neutrophil inclusions was observed and discussed several times in other reports ; moreover these works demonstrated how TGNs are especially helpful in predicting acute bacterial infection , while the development of candidaemia-related TGNs was rarely described and in-depth. TGNs is the term used when the normally faint stippled granules in neutrophils stain an intense reddish violet which is a consequence of activity against bacteria or proteins and is observed in serious infections, toxic or drug effects, or autoimmune processes (e.g., chronic polyarthritis) . Normal bone marrow granulocyte maturation is associated with progressive decreases of azurophilic granule enzymes (myeloperoxidase, defensins, lysozyme, azurocidin, etc.). On the contrary, the origin of TGNs has been considered to be related to abnormal neutrophil maturation with persistence of azurophilic granules, containing acid mucosubstance which stains more prominently than under normal circumstances . The acidic mucosubstance accumulated in the toxic granules has the potential to acidify phagosomes enhancing bactericidal activity, since bacteria in phagosomes are killed more effectively at pH of 5.5 than of 7 . Our blood smears confirmed the findings of Kabutomori, et al. highlighting TGNs only within neutrophils without phagocytic yeast inclusions; It is probable that these granules prepare the phagocytosis and disappear upon the occurrence of the same. Luo, et al. studied with a Sysmex XE-5000 automated hematology analyzer, the inner granules or vacuoles of neutrophils by sideward scatter light (displayed as neut-X), the cellular nucleic acid (DNA and RNA) content by sideward fluorescence light (displayed as neut-Y) and the vector sum of neut-X and neut-Y (displayed as neut-Z). The authors  demonstrated a lower tendency to the development of TGNs in case of candidaemia compared to bacterial sepsis, especially those induced by gram-negative bacteria. Our reports clearly showed the development of marked toxic granules even during the acute phase of Candida spp. bloodstream infection. In addition, the analysis of medical records and laboratory data excluded other non-infectious conditions as possible causes of TGNs development. The microscopic observation of marked TGNs can afford to suspect a systemic microbial infections without the potential to discriminate between bacterial or fungal infections. The authors thanks Dr. Adele Braione for providing us technical advice and moral support. Wenzel RP (1995) Nosocomial candidemia: Risk factors and attributable mortality. Clin Infect Dis 20: 1531-1534. 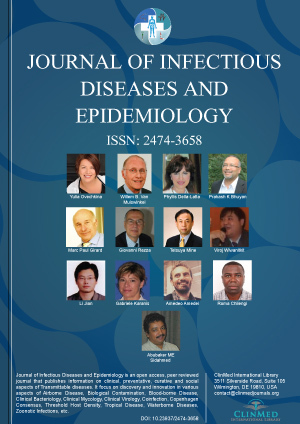 Clancy CJ, Nguyen MH (2013) Finding the "missing 50%" of invasive candidiasis: how nonculture diagnostics will improve understanding of disease spectrum and transform patient care. Clin Infect Dis 56: 1284-1292. Paramythiotou E, Frantzeskaki F, Flevari A, Armaganidis A, Dimopoulos G (2014) Invasive fungal infections in the ICU: How to approach, how to treat. Molecules 19: 1085-1119. Miglietta F, Faneschi ML, Lobreglio G, Palumbo C, Rizzo A, et al. (2015) Procalcitonin, C-reactive protein and serum lactate dehydrogenase in the diagnosis of bacterial sepsis, SIRS and systemic candidiasis. Infez Med 23: 230-237. Yera H, Poulain D, Lefebvre A, Camus D, Sendid B (2004) Polymicrobial candidaemia revealed by peripheral blood smear and chromogenic medium. J Clin Pathol 57: 196-198. Hirai Y, Asahata S, Ainoda Y, Fujita T, Miura H, et al. (2015) Candidemia diagnosed from peripheral blood smear: Case report and review of literature 1954-2013. Mycopathologia 180: 111-116. Al-Gwaiz LA, Babay HH (2007) The diagnostic value of absolute neutrophil count, band count and morphologic changes of neutrophils in predicting bacterial infections. Med Princ Pract 16: 344-347. Theml H, Diem H, Haferlach T (2004) Color atlas of hematology-practical microscopic and clinical diagnosis. Thieme, Stuttgart, New York, USA, 198. Schofield KP, Stone PCW, Beddall AC, Stuart J (1983) Quantitative cytochemistry of the toxic granulation blood neutrophil. Br J Haematol 53: 15-22.
van de Vyver A, Delport EF, Esterhuizen M, Pool R (2010) The correlation between C-reactive protein and toxic granulation of neutrophils in the peripheral blood. S Afr Med J 100: 442-444. Kabutomori O, Kanakura Y, Watani Y (2002) Induction of toxic granulation in neutrophils by granulocyte colony-stimulating factor. Eur J Haematol 69: 187-188. Luo Y, Lin J, Chen H, Zhang J, Peng S, et al. (2013) Utility of neut-X, neut-Y and neut-Z parameters for rapidly assessing sepsis in tumor patients. Clin Chim Acta 422: 5-9. Dr. Fabio Miglietta, Laboratory of Microbiology, Vito Fazzi Regional Hospital, 83, Montegrappa Street, 73018, Squinzano, Lecce, Italy, Tel: +39-3492548568, Fax: +39-0832782033. © 2019 Miglietta F, et al. This is an open-access article distributed under the terms of the Creative Commons Attribution License, which permits unrestricted use, distribution, and reproduction in any medium, provided the original author and source are credited.